Update Feb 15, 2014: This restaurant is now closed. 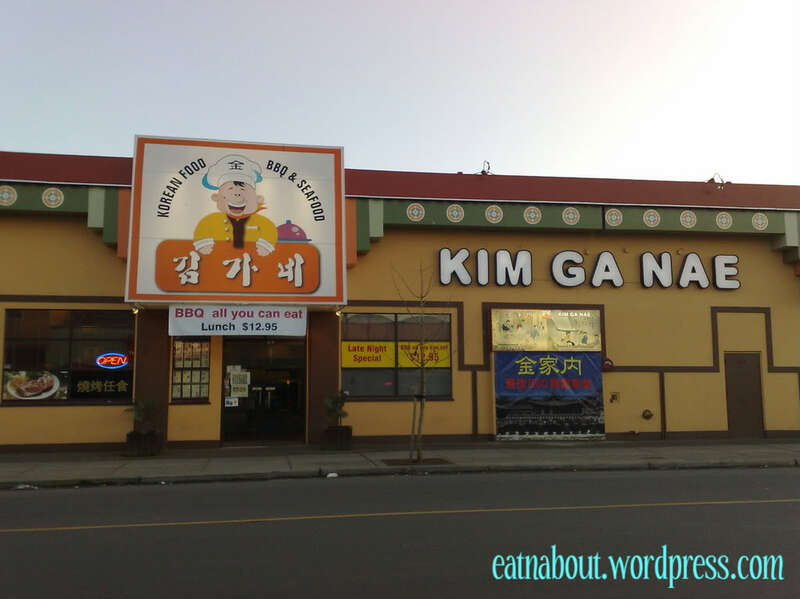 This is one of the newer Korean BBQ restaurants in Richmond. It is located at Browngate Road diagonally across from Aberdeen Centre. 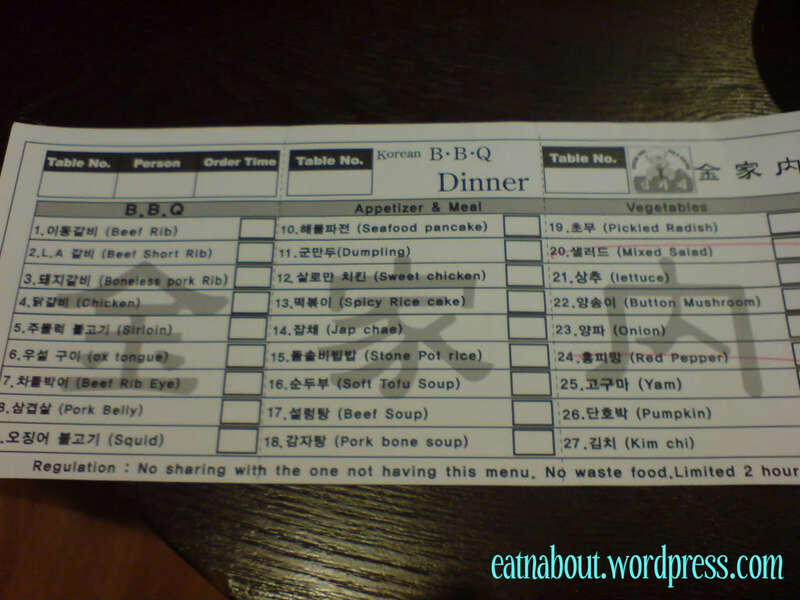 They boast 27 items on their AYCE BBQ menu, which is $19.95 at dinner time. However, as you can see, two items are crossed off, making the total number 24. But those two items aren’t BBQ essentials so I guess they can be forgiven. 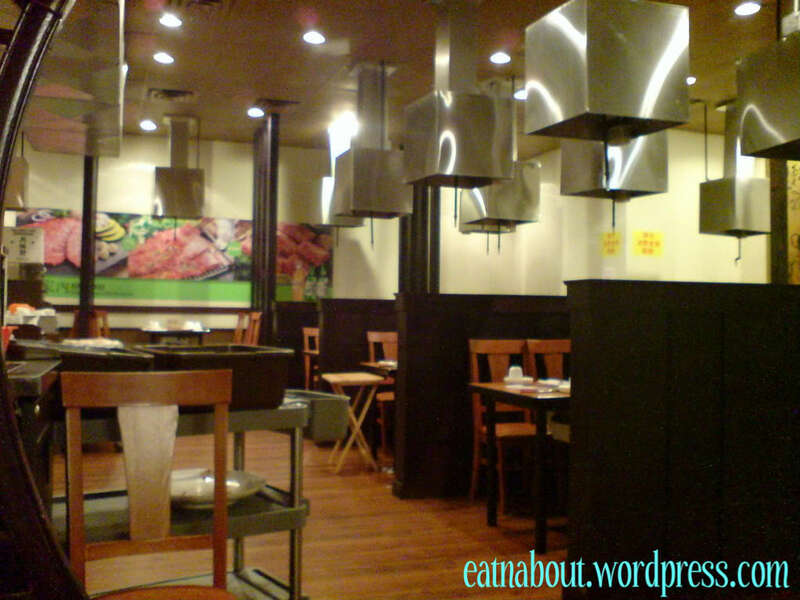 The restaurant is divided into two sides- one for BBQ, one for the regular non-BBQ menu. They also have 2 “rooms”. 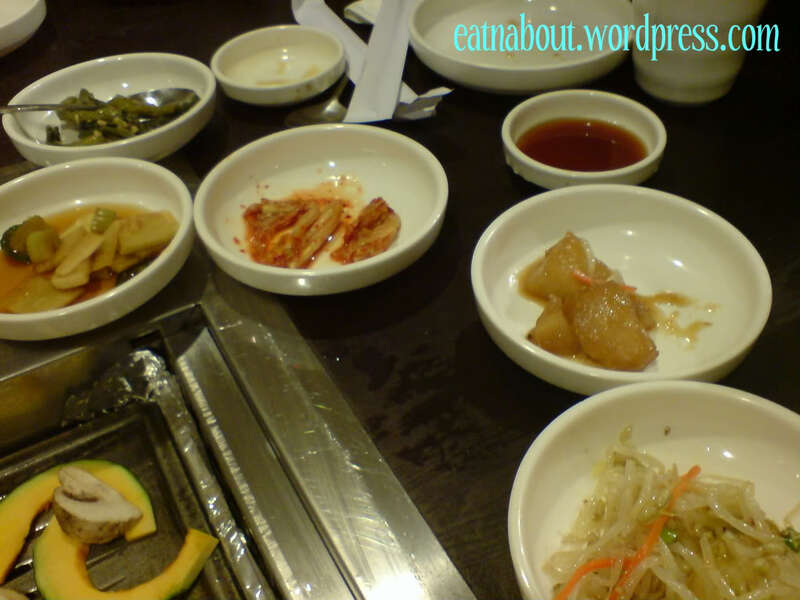 They do serve a variety of banchan at the beginning. I’m not sure if these had to be ordered since they were on the menu. Everything was pretty good but the potatoes weren’t as sweet as I would’ve liked it. Other places make it better. These are some of the non-BBQ offerings on the menu. There’s the seafood pancake on the left and spicy rice cake on the right. The pancake was just ok. There was only a bit of seafood right in the middle and there was a big “crust” part. The spicy rice cake was yummy, but it wasn’t ‘temperature’ hot enough, so we didn’t know how fresh it was. However, when we ordered it again later it was steaming, so I guess the first time really wasn’t fresh. Here on the left is the beef soup. I found it pretty flavorful. I quite liked it. However I would’ve liked it more if the noodles were the sweet potato noodles like other places make it. 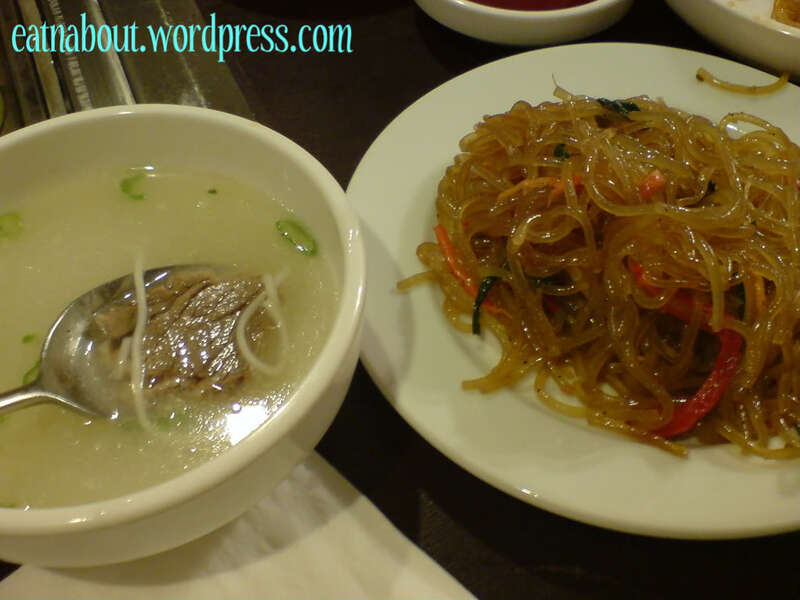 On the right is the Japchae, potato noodles with meat and vegetables. This was just ok. It was cold also. 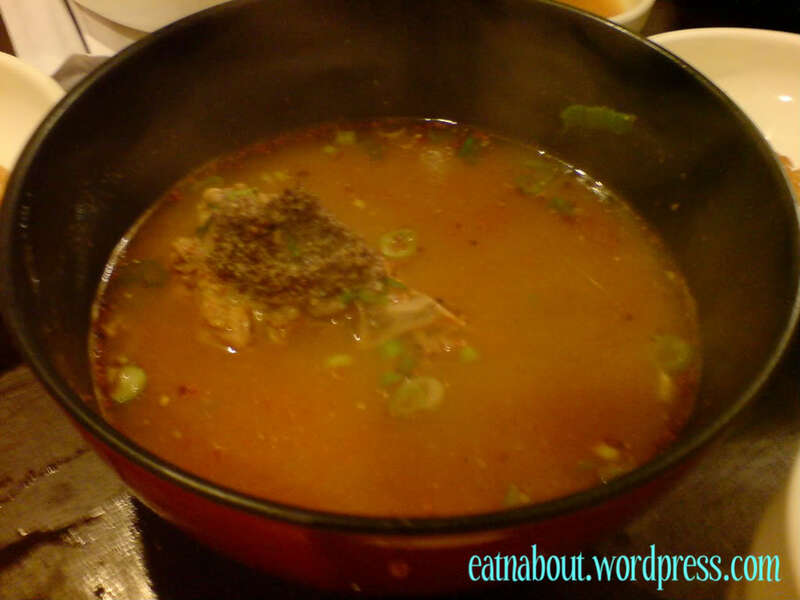 My mom and dad really liked this Pork bone soup. They said it was very flavorful and there was a lot of spices in it. It was about a 2-people portion and they ordered another one afterwards, so I guess they REALLY liked it. 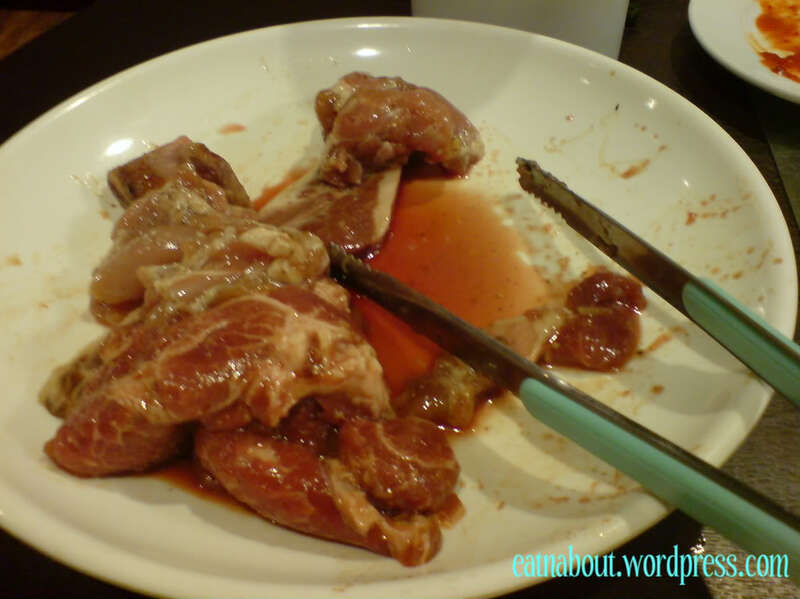 The pork bone actually had a bit of meat on it too. Next my dad had the Stone bowl rice. It was a one-person portion and it was SO CUTE. There was no meat in it though, but there was an egg, as you can see. Last time I had it it came sizzling. Not this time though. It came was a sauce for you to squirt into the rice after mixing. Dad said it was just ok.
Next is the meat. When it came it was nicely plated and separated on the plate, not like this mess we made. 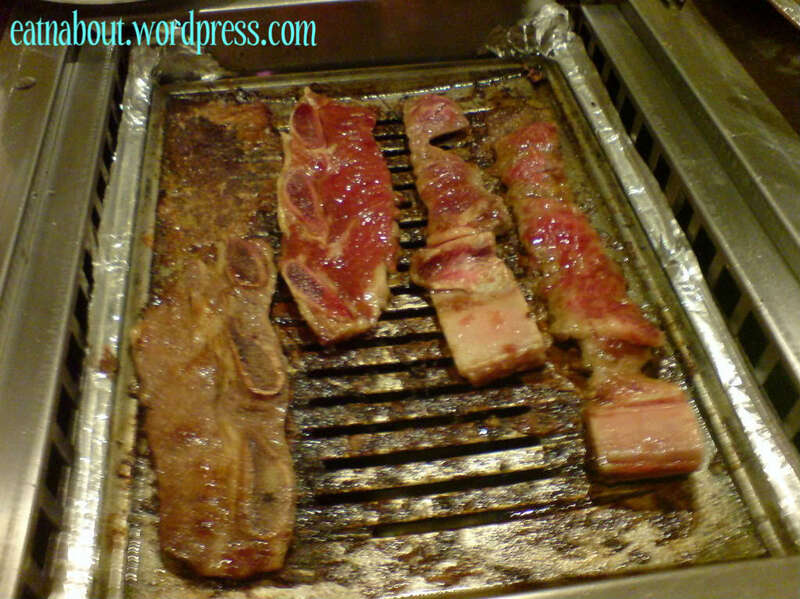 I would recommend the Beef rib, short rib, pork boneless rib, chicken, and ox tongue. The sirloin is not good barbecued. Everything was nicely marinated. On the left is the beef short rib, and the beef rib is on the right. We had to unroll the rib by ourselves and I found that really interesting. It was very tender. It was a good dinner, not the best though. We might come back, but perhaps after a while. I think, not sure, that they offer lunch [same menu] for 14$ or so…read it on local forums. 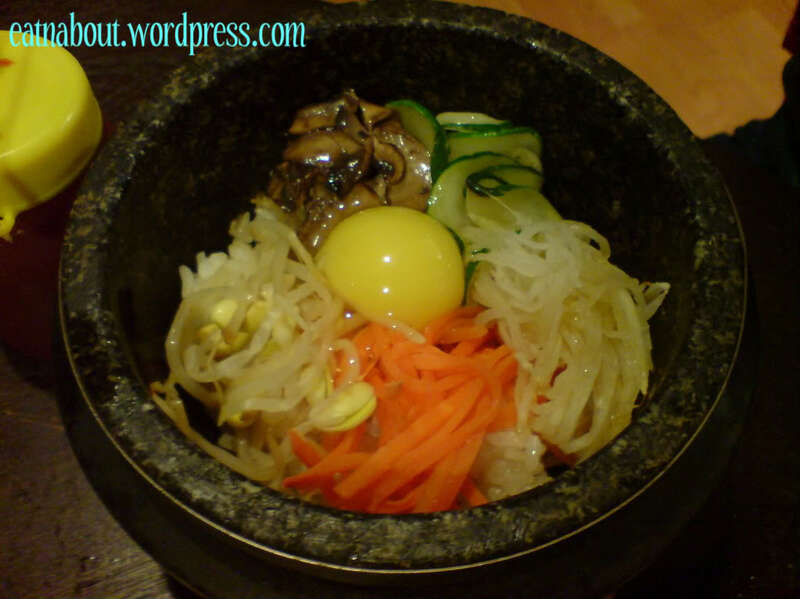 I think this deserves a try..bibibamp [stone bowl rice] and pork bone soup on an AYCE menus? That’s different for a korean place. Lunch and late night is actually $12.95! Has a bit less stuff though, from memory it’s a bit less choice of BBQ meats I think. My friend just ate there and was raving about it. 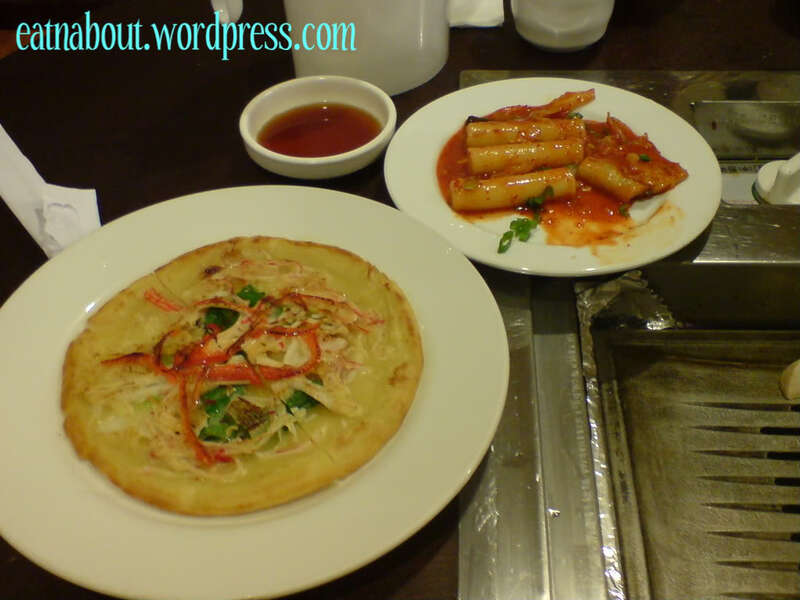 However, look at the photos you took, some of the stuff seems a bit unappetizing, especially the seafood pancake. Do you think it’s worth it for me to drive from North Burnaby to Richmond to try it? Anyway, I’ll assume your friend has the same taste as you? So if he/she raved about it, likely you’ll enjoy it too? And it’s all-you-can-eat so you can’t lose right? Worse comes to worst, just eat the BBQ and don’t touch the other stuff! It’s worth a try really, if you don’t like it than you know not to come back (obviously!!). I went and it was actually pretty good. Thanks for the review! That helped! I’m glad you liked it! Did you try the seafood pancake??? Yes I did… I didn’t like it… LOL… But everything else was not bad for AYCE. 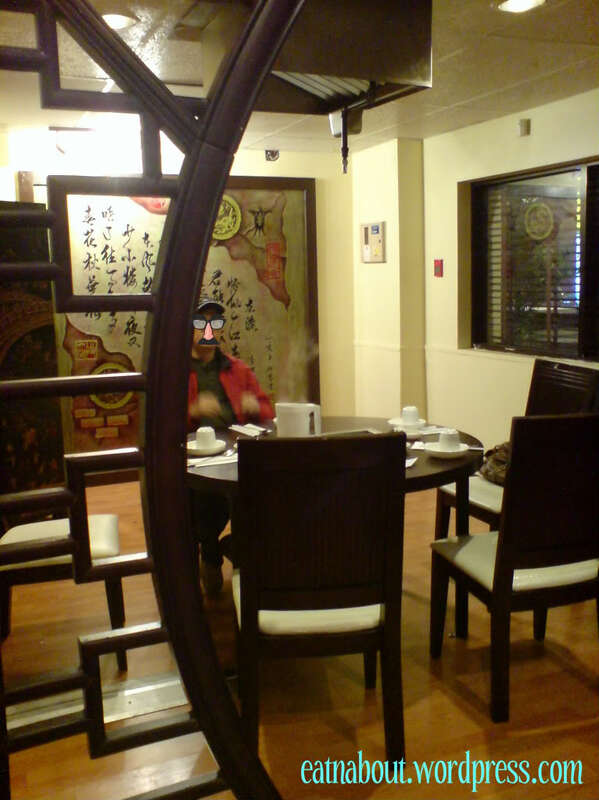 But I couldn’t the guy with the funny glasses and mustache like the one in your picture… AHAHAHA…. Actually that’s my dad. For reals. How slow was the service? Is this place better than that lousy one in Lansdowne?